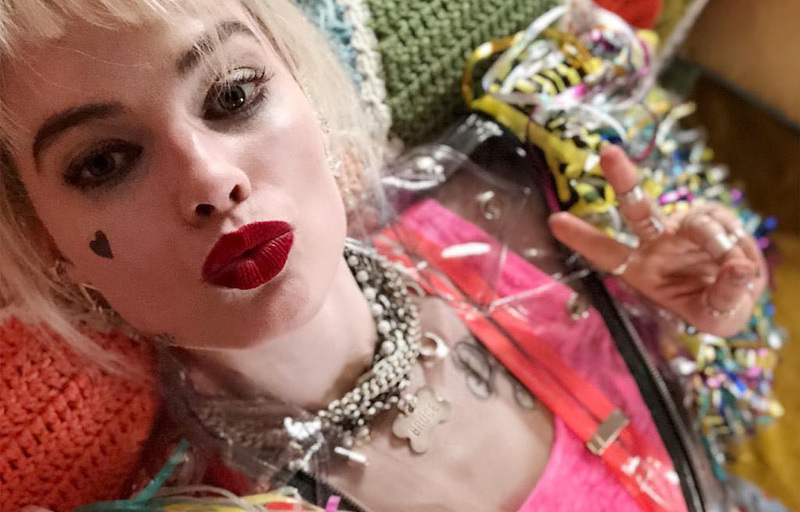 Birds of Prey is happening with the return of Margot Robbie as Harley Quinn. And she’ll be joined by Mary Elizabeth Winstead as Huntress and Jurnee Smollett-Bell as Black Canary. The film is expected to be Rated R with principal photography already underway. A very short teaser video has been released, and it isn’t the first time WB has released these fun little videos to promote a DC film; for example, the Joker movie starring Joaquin Phoenix. In addition, Robbie has shared a photo of herself as the crazy villain on Instagram along with people snapping some on-set photos. Check out the “See You Soon” teaser where you can see the different cast including Ella Jay Basco as Cassandra Cain, Rosie Perez as Renee Montoya, Chris Messina as Victor Zsasz and Ewan McGregor as Black Mask… sans the mask. In the photo, Robbie puts a caption: Miss me? Below is an on-set photo showing off a different outfit for Harley Quinn. It definitely has a circus vibe with the red and blue stars and striped pants. Margot Robbie was previously seen as Harley Quinn in the Suicide Squad film by director David Ayer. It made a lot of money at the box office but was panned by critics with mixed reactions from the audiences. The film is being directed by Cathy Yan (Dead Pigs). The movie stars Margot Robbie as Harley Quinn, Mary Elizabeth Winstead as Huntress and Jurnee Smollett-Bell as Black Canary. Warner Bros. is still keen on bringing its DC characters to life on the big screen. It is focusing less on a shared universe, especially if you compare the box office numbers for Justice League with Aquaman. Aquaman recently became the #1 DC film of all time at the worldwide box office. Next up is Joaquin Phoenix playing the iconic Batman villain. The Joker solo film hits theaters on October 4, 2019.